Yourself Expression, the newest direct sales company that was founded by two kids to help parents pay for private school. This company is a business established by two young, creative and industrious kids; one of them is a 14-years old girl while the other one is her 9-year old brother. Yourself Expression was born as a result of a very inspiring story. During Christmas 2013 Shelby asked for a pair of expensive boots with bows on the back. The parents of course said NO and told Shelby that she could create the same look on her own and make them with designs that she could change out. This is where the interchangeable concept for the company came from. The kids started selling the bows for boots called Boot Bling to friends and family. As they began earning money, Shelby’s goal was to help her parents pay her expensive tuition fee as she moved up to high school. Within a few months, she established a small business with her young brother, Gordon Gogulski and they became the co-founders of Yourself Expression, a new family friendly direct selling company that is located in Jacksonville in Florida. Yourself Expression is a company that offers a wide variety of interchangeable accessories from head to toe and even items for the family pets. This company is engaged in selling memory lockets, snaps and poppers, and shoe clips. 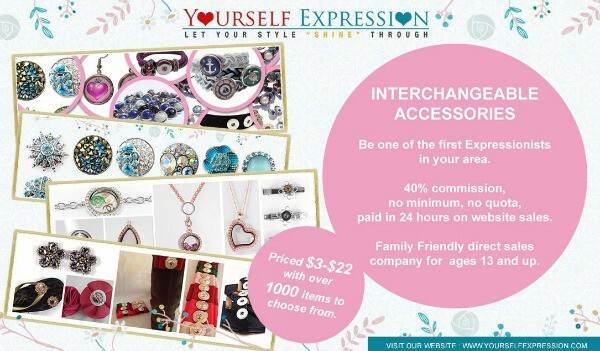 Established by two young people, Yourself Expression will be an exclusive direct selling company of interchangeable accessories that offers items for everyone in the family. Yourself Expression offers quality products at affordable prices so that no matter the age or income you can afford to look fabulous. It’s about expressing the uniqueness of each one of us. These young entrepreneurs are looking for other people 13 and up to become Expressionists and start their own career path with Yourself Expression. They have a low start up, free webpage for new members, no quota and a simple to understand compensation plan. Yourself Expression is a company that offers a wide collection of interchangeable accessories for families. This company is owned and managed by Shelby and Gordon Gogulski. Yourself Expression is located at Jacksonville, Fl. 32225. To learn more about Yourself Expression, please feel free to visit http://www.yourselfexpression.com/.